The Montana Bill of Sale Forms are legal documents that sellers and buyers alike would use to prove and record purchases and/or trades. These forms will prove that a legal transaction has taken place as well as the change of ownership. The forms also provide vital information with regard to the vessel, vehicle, firearm or any personal items sale, to include any identifying numbers and/or information. Some forms will require notarization for authentication. Boat Bill of Sale – This document would be used to prove a legal sale and change of ownership of a vessel/boat (motorized). Firearm Bill of Sale – This form would be used to document the legal sale and purchase of a firearm. General Bill of Sale – Generally, this document is used by two private parties to document the sale and purchase of personal items. 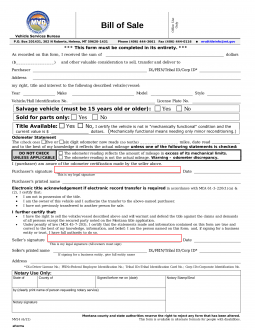 Vehicle Bill of Sale (Form MV24) – This document will provide information regarding the legal sale and purchase of a motor vehicle.